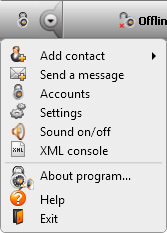 Click the icon in the main window of Safety Jabber program or choose “Settings” in the bottom drop-down menu (Picture 1). 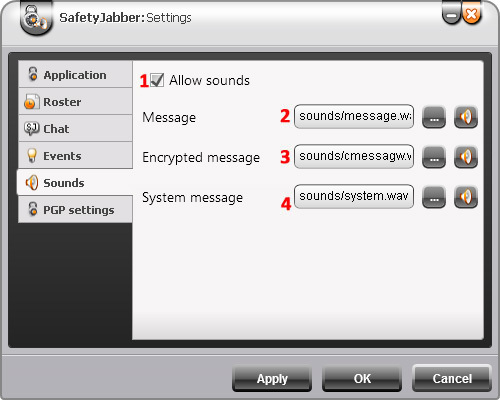 The window of settings of Safety Jabber program will be opened. Choose the tab “Sounds” (Picture 2). Choosing a sound file for notification when receiving a message (unencrypted). Choosing a sound file for notification when receiving a message (encrypted). Choosing a sound file for notification when receiving a system message. The last right buttons with the picture of dynamic allow to listen to the chosen sound file.